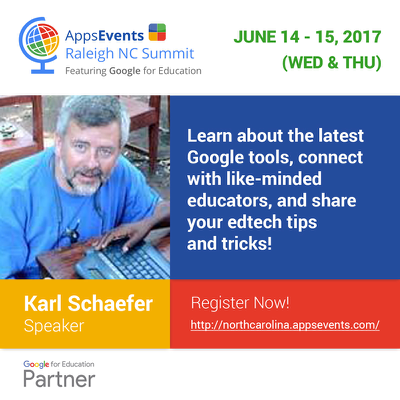 I would love for you to come and learn with me this summer as I will be one of the speakers for the 1st AppsEvents Google for Education Raleigh North Carolina Summit to be held at Cardinal Gibbons High School on June 14 & 15, 2017. This high intensity two day event focuses on deploying, integrating, and using Google Apps for Education and other Google Tools to promote student learning in K-12 and higher education. The program features Google Certified Teachers, Google Apps for Education Certified Trainers, practicing administrators and solution providers and you can find the schedule here. Register now to send teachers, administrators, tech directors/tech support staff, and anyone who is interested in finding out more about leveraging Google tools to support student learning. I will be doing two sessions: G Suite Loves iOS – Experience the Love Between Them and Get Your Story On with Toontastic 3D App. Both sessions will be fun and move you from your starting point forward with tips and tricks for how to incorporate these great tools into the learning of your school and students. If you can not come but would like to work with me, check me out in the Google for Education Trainer Directory and send me a request.